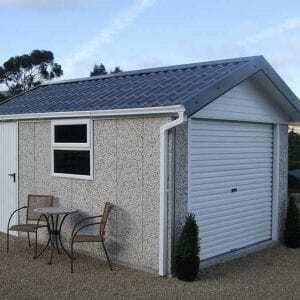 Our Concrete buildings range is available in four distinct styles with a building to suit all requirements from a secure storage unit to a workshop to a proper garage for your car. These buildings are built from prefabricated concrete sections bolted together with a maintenance free aggregate finish to the outside which matches the dry-dash finish of many Irish homes. Roof cover is provided by black Onduline roof panels with a translucent panel for natural light. There is a selection of timber cladded or galvanised steel single access doors or full roller shutter doors to allow access for a car. 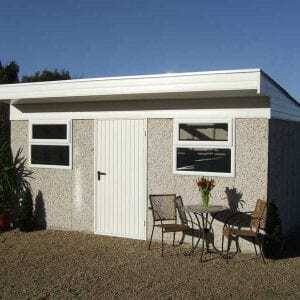 There are also a choice of PVC windows to add further light and character to your new concrete building. 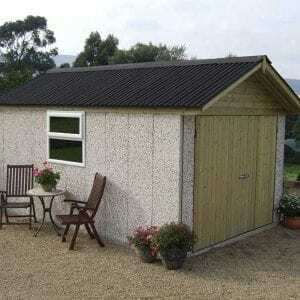 Our concrete and Duraboard buildings must sit on a concrete base which has been constructed to our dimensions and specifications. 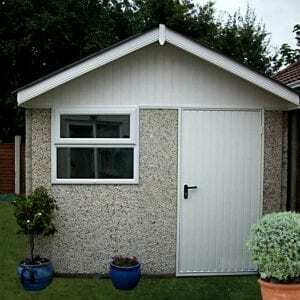 We can offer this base building service at an extra cost, please ask for more details and one of our representatives will call to your home and quote for this work. If there is restricted access please be sure to advise us in advance.